Phonographic Copyright (p) – Metroplex Records, Inc. Copyright (c) – Macola Record Co. Publisher: Electro Groove Music, BMI. 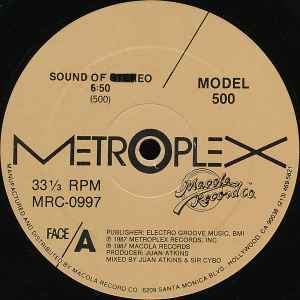 (P) 1987 Metroplex Records, Inc. The version of ‚sound of stereo‘ on here is much better than that on m-011 IMO, although ‚make some noise‘ is not as good as ‚electric entourage‘ and ‚interfearance’. Best to buy both records then!